Can you believe it's the end of the month again??!! That means that our challenge for you all is Anything Goes! The team are playing with Technique Tuesday products today, and if you have any, we'd love to see you using them, too, but you can use anything you'd like. I took this as a sign to finally get myself Cath Edvalson's Heartfelt Thanks stamp set, and I made 2 cards with it this week. My next card might work for Valentine's day; it's a color scheme I've used for that occasion in the past, and it's a CASE of a card by Laura Fulcher. I am continuing to play with some of the smaller flowers and leaves from Altenew's Vintage Flowers stamps, and decided to make a cheery blue and yellow card. I used the last of this pretty blue gingham from a Simon Card Kit late last year. Leslie used real lace and a velvet ribbon and some lovely soft colors - I used paper versions, and brightened my colors, using what I have on hand here. I don't think this will be my last try at CASEing her card - it's that beautiful! 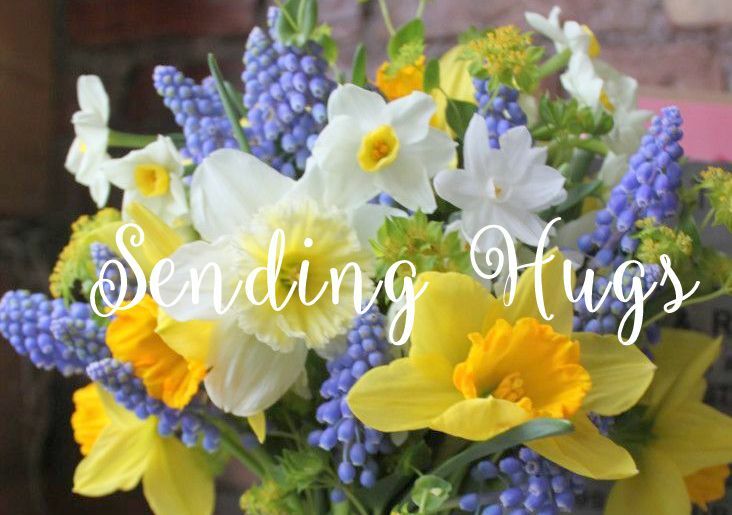 Hope you're enjoying your holiday weekend - we have sunshine today!! This was an easy one to make - I colord the stamped panel with my Zig markers and water, then trimmed it out, framed it with a robin's egg panel, and then attached it to the embossed roses background! I stamped the image a 2nd time just to color in the swirly roses and cut them out, then popped them above the panel for some dimension. 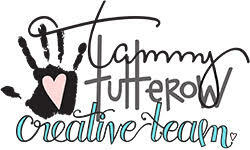 Don't forget to visit Tammy's blog today to see what my other teamies have been working on! I've seen several people use metallic/pearlescent watercolors on black cardstock, and I wanted to throw my hat in the ring, too. 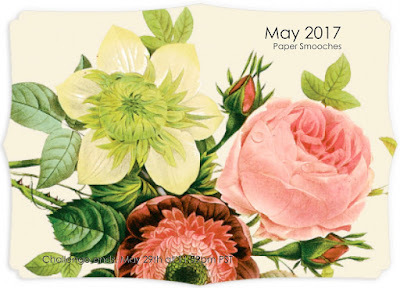 The main floral image from Simon's Floral Bliss stamp set is the perfect vehicle to try this technique. I also stamped and platinum embossed one of the single flowers in the stamp set on 2 pink slices of paper, to pull all the glitz all the way across the card, and added 3 clear sparkly sequins for a tiny bit more. These watercolors are lovely against black - I only wish I could capture how pretty they really are, but I have a dreary day here, so I had to wing it! If you want to see more examples of this technique, be sure to visit Simon's June 2017 Card Kit Gallery HERE, and look for Amy's and Nichol's gorgeous cards. 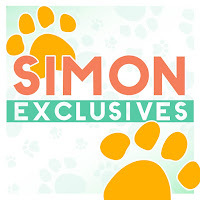 This week our theme is "Furry Friends" and the team are playing with Paper Smooches products. I used a well-loved stamp set for my card. I stamped the dog and then a mirror image of him, then cut them both out, and built my little scene around them. 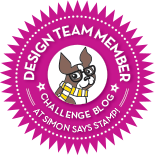 I was so thrilled to be asked to Guest Design over at Wplus9's Stamp Away with Me blog! Here are the 3 cards I made for today! 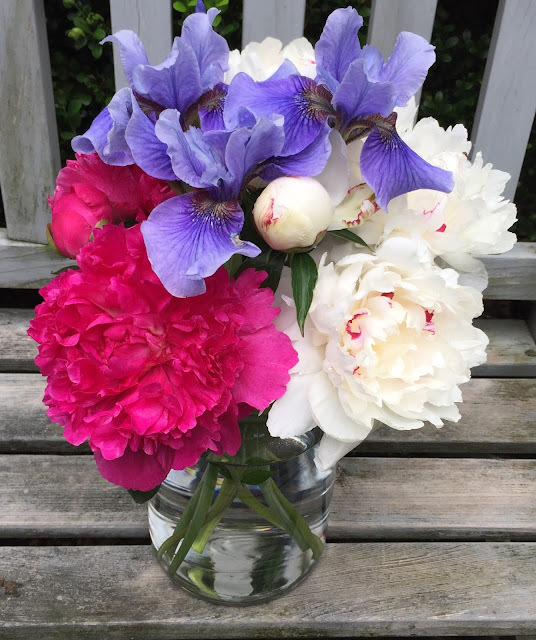 For more details and pictures, please visit Dawn's blog! Here's a 2nd card using the Simon June Card Kit. I white embossed the pretty floral onto a strip of vellum, colored it with Zig markers, turned it over, then wrapped it around a panel of script dp. That was framed with black strips and striped paper, and the sentiment was added to finish. It's still available, but don't wait too long - I'm positive it will be another sell out! 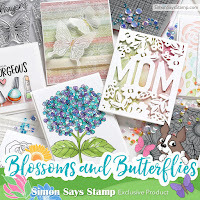 I think the Simon June Card Kit is one of the prettiest in awhile - of course, I'm a flower girl, so I may be a bit biased! Mine arrived this afternoon, and here is my first card using the supplies in the kit (plus my own pale pink pearls and 2 tiny strips of a mocha paper). 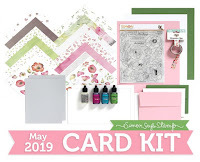 Can you see that there are TWO full-size ink pads in this kit, a sample of Daniel Smith watercolors, and a gorgeous ivory metallic envelope, not to mention those beautiful patterned papers! 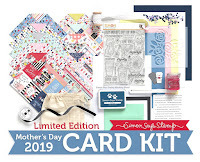 Run to Simon Says Stamp before this kit sells out!! I love gingham and yellow, so when I saw the inspiration for the current Mix It Up challenge, I was in! I loved the yellow flowers and gingham cloth in the photograph, and made a stab at the sketch, too, changing the circle to a scalloped rectangle; I like the look of the white scallops with the yellow gingham. 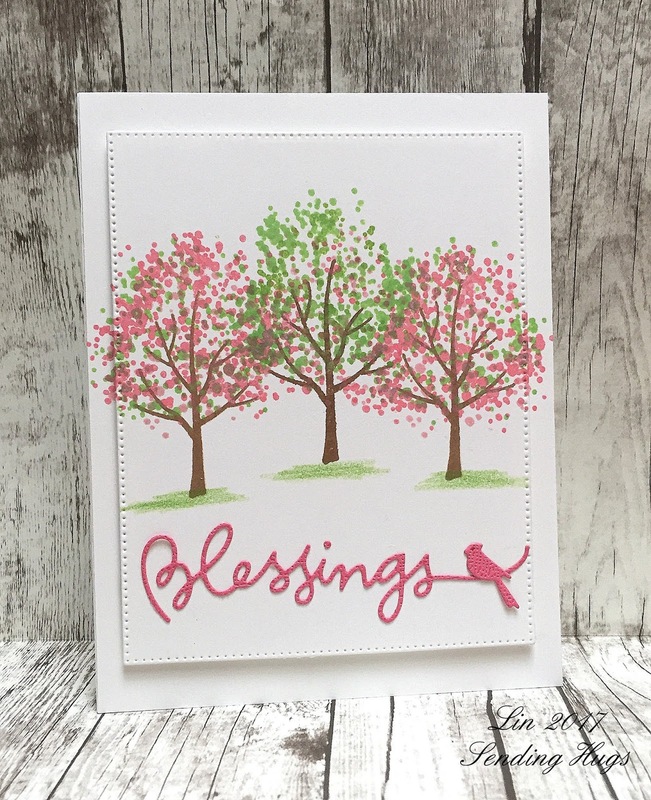 Thank you, Sugar Pea Designs, for allowing us to use other stamps for your challenges! 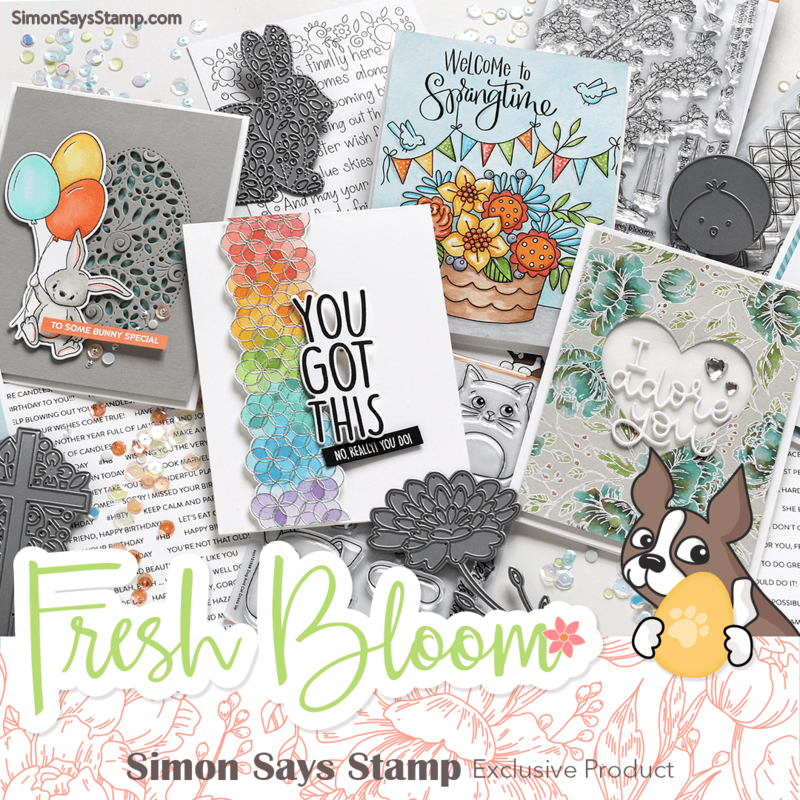 Our theme this week is "A Little Sparkle", and we are playing with our own Simon Says Stamp exclusive products this week. Since we're in the vicinity of Mother's Day, I decided to make a glitzy feminine card. This pretty stencil came out during a Christmas release, but I think it can be used for all occasions. After applying my paste and removing the stencil, I sifted on some glitter. While that was drying I made my crinoline flower and cut the love die 5 times, to make it stand out from the card. This glitter really sparkles, but I can't seem to get a picture of it. I thought I'd balance all the fussiness above with a simpler design for my next card. Because the sentiment has a heart built in, which I covered with a punched heart, I also added more of the little hearts along the flight path of the butterflies! And I popped up the 3 biggest butterflies for some dimension. I took one look at the Altenew inspiration colors for this month, and thought of my Mom - that bright fuschia pink is her color. So I thought I'd make a birthday card now for her birthday in August. I know she'll love this, especially with the glittery circle! It started out as a one-layer card, but when I decided to use the circle, I had to fussy-cut out my image, and layered it over the circle. Today I used a lovely spring green and one of Tammy Tutterow's new cling stamp and die sets for my card. I stamped once on gingham and once on dots, then cut the dots apart and paper-pieced them back onto the gingham backing, using a colored pencil on the peapods and leaves. The panel was then die-cut with the matching die and glued over the heart embossed background. I added some tiny pink hearts over the design and some sparkly sequins to finish. 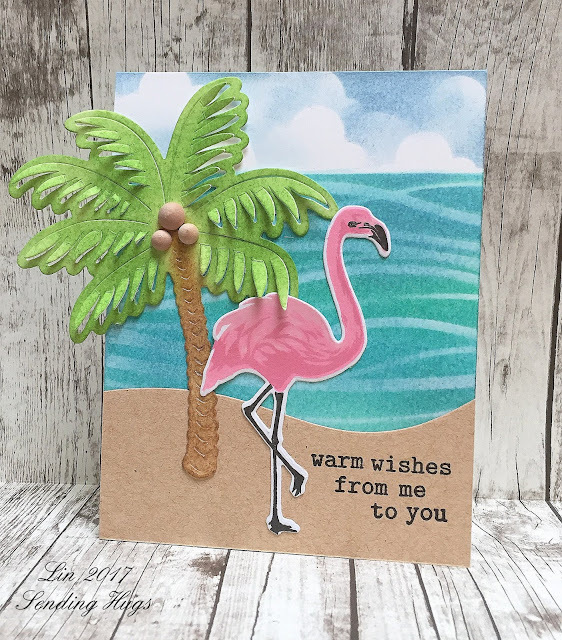 Don't forget to check out Tammy's blog today for her bi-weekly post where this card and other gorgeous creations from her creative team will appear! Our theme this week is a favorite of mine, "Going Dotty!" And the DT are all playing with fun Stamping Bella goodies. You don't have to use them to enter, but if you do have any of their products, we'd love to see what you do with them! 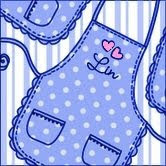 I have 2 StampingBella sets now and love using them - they are perfect for paper-piecing! I've used my favorite periwinkle color to paper-piece her dress, coloring the rest of the image with markers and pencil. I doodled a border after trimming the panel, then framed it in a pink to match the ice cream. For my backing papers, I used scalloped dies to mimic the lace on her dress. Last time I used this stamp, I paper-pieced her in yellows, but I'm loving this fun mini dot green this time! To go along with the sentiment I chose, I covered the raindrops on the stamp with little punched hearts. I finally got myself a wood plank background stamp and here is it's first use. This is a 6" square cling stamp, so it can make vertical or horizontal planking. I like the subtle pattern it adds to this card. I couldn't wait to receive this Stitched Roses stamp set! For many years I did cross-stitch, and thorougly enjoyed how you could achieve such lovely shading. It's been a dreary couple of days here, so I am feeling a bit blue, and decided to use that color for my first card using this set. To my knowledge, they haven't achieved blue roses in nature yet, so these will have to do until then. I practiced a bit before proceeding, and I'm still having trouble getting the layers lined up - I think this set is a bit too complicated for these old eyes! If you have this set, I'd love to know any hints you might have for me. 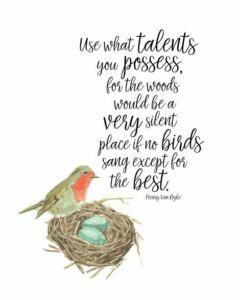 I did use my Misti, but that little flower isn't perfect........I'll keep practicing! Hope your weekend is sunnier than ours! When I saw this month's Paper Smooches challenge, I remembered this cute die of theirs, and decided to do some paper-piecing with it! I love pink and green together, and these tiny prints worked well to inlay the various parts of the flower die. Using the Stick It makes it lots easier, too, to secure everything down nice and tight: after I die-cut the flower and words from my white panel, I removed the die-cuts and added some Stick It to the back of the panel. Then I die-cut from the various other papers and paper-pieced them back into the design. When everything was finished I added the scalloped edge at the bottom, and mirrored it with another in black, then popped the panel over the cute heart print paper, and sprinkled some pearls. Our theme this week is "A Hint of Pink", and we are playing with Hero Arts, one of my favorite companies! You don't have to use their products to enter, but if you have any, we'd love to see what you do with them! I have had this flamingo for a little while, and after having spent the winter in FL, I wanted to get this palm tree die to go with him. I love the dimension it gives us! For that reason, I couldn't cut off the overhang from the card.....it will have to go into a bigger envelope! My next card uses a stamp that was designed to be used in the fall, but I think it can be used for any season of the year. It uses a bit more than a hint of pink.